20th anniversary gifts are traditionally celebrated with china. The modern symbol is platinum and the color symbolical of this anniversary is emerald green. The gemstone is emerald or a yellow colored diamond. None of these symbols are particularly cheap but a 20th wedding anniversary is worthy of a big celebration. And there are lots of ways to take these symbols and create some pretty wow gifts. Using the 20th anniversary color of Emerald green here are a number of inexpensive anniversary gifts. With china as the symbol what could be nicer than dinner at your favorite Chinese restaurant or even a takeout. You could splash out on a set of Chinese bowls and chopsticks and then you have your very own Chinese experience at home. Or you could go to the nearest China town and paint it red! Buy some Chinese delicacies to take home and share the goodies with the family. A truly cheap China themed anniversary gift is watching a string of Jackie Chan movies! Share the fun with family and friends. Don't forget the popcorn and hotdogs! You could have your very own fairly cheap 20th anniversary party loosely themed on China! If you are more adventurous then you could set yourself your very own Ninja warrior assault course in the backyard - fancy dress would have to be a must! One very neat way to include the gift of china into a homemade gift is to create your own Anniversary mug or plate. 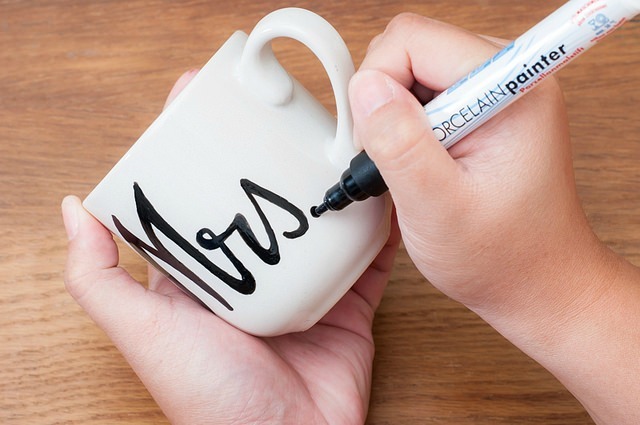 Add your design to your mug with the pens and leave it to dry for 24 hours, or even longer if you have time. Next place them into a cold oven and turn up the temperature to 425 and bake the mugs for 20 minutes. Turn off the oven and leave the mugs in there until it is cold. Remove the mugs and you are ready to wrap them! To make sure your designs stay put it is a good idea to only hand wash them. The best gift of all and the cheapest, money-wise but not value-wise, is the gift of time and love. Make an effort to spend quality time with your spouse. Give your spouse coupons of hugs, kisses and snuggling to be redeemed in case they are badly needed. Give your spouse coupons for dinner and movie nights; a night-off with friends; an overnight stay at a hotel; or just a lazy day at the spa. These cheap anniversary gifts are not cheap at all as value-wise, they are priceless.